I don’t recall ever thinking much when I played the game as a young child. I just played and I played well. 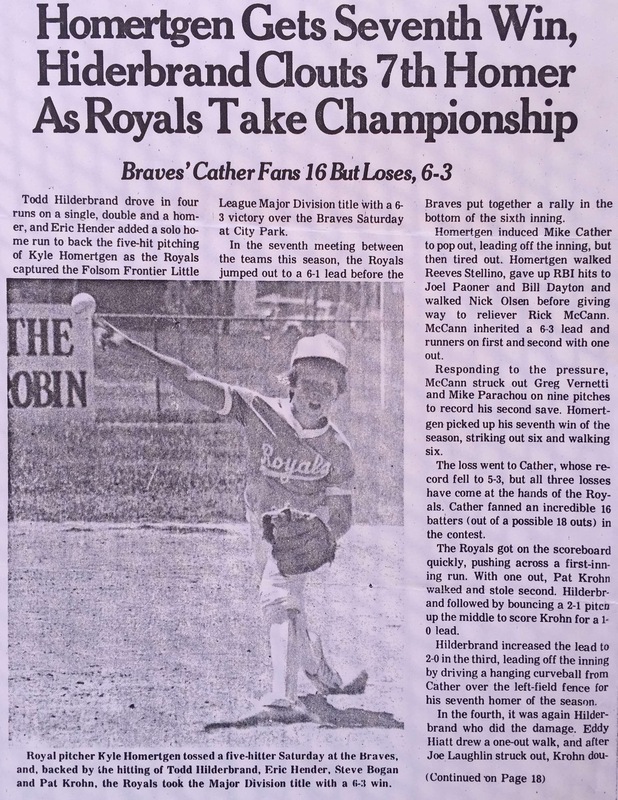 As I continued to play well through those young years I am sure the ego or my ‘false self’ as John of the Cross described it (St. Paul called it the ‘Old Man’), began to grow in attachment to results, prestige, being in the newspaper for throwing a no-hitter, etc. I am sure I began to think about what others thought of me, how I was respected and regarded. I began to think about my future in the game, would I make the high school team. I remember a big shift in the 8th grade where I started thinking too much, I became nervous, I started to play poorly, throwing strikes in important games started to elude me. After the 8th grade, growing up in the small and lovely town of Folsom, California we moved to Southern California. I went from an 8th grade class of 12 students to a freshman class alone of some 700 at Mater Dei High School in Santa Ana. So overwhelmed and lacking any confidence I didn’t even try out for high school baseball until my sophomore year. I tried out and made the team as a pitcher. Without a live game setting I seemed to impress enough. I was grateful for Mr. Cather who taught me the slider in grade school. I would guess that having that extra pitch got me on the team. The first day of practice the varsity pitching coach approached me and stated, “I got you on the team so don’t screw up” and “the way you are throwing the ball is all wrong”. I don’t recall him ever speaking to me again. In truth I froze from there on and never pitched a live game the entire year as I couldn’t turn my brain off and just pitch, just be in the flow of the game and have fun. I believe I suffered from ‘Steve Sax Syndrome’. No longer pitching, I played 3rd base, the ‘hot corner’ where if a play involved a quick reaction i.e. a fast line drive for me to dive for I could routinely make those plays. However, what was dreaded was the routine grounders, slower to arrive to me, that is where all hell broke loose. Time would freeze, I would see 3 balls approaching rather than one, if I managed to actually field it properly I would aim rather than throw to the first baseman (my poor best friend, Greg) and often the ball would go most places other than directly to his glove. It was such an awful, crushing feeling. I dreaded playing home games for fear that the varsity coach, Mr. Ickes, my freshman year algebra teacher with a stern military name calling approach would be watching. I had so much respect for him as I could see his commitment to and knowledge of the game, his attention to detail, yet I could not please him and I feared him more than most. I melted under the pressure. In fact, I am now 44 years old and until recently still had dreams of him, of making errors in front of him on the field. Luckily much less frequent these days do dreams of such failures come. Much less frequent due to finally letting go and accepting failure and moving on. Dying to the false self and rising in transformation closer to my True Self. The task of the first half of life is to create a proper container for one’s life and answer the first essential questions: “What makes me significant?” How can I support myself?” and “Who will go with me?” The task of the second half of life, is quite simply, to find the actual contents that this container was meant to hold and deliver. As Mary Oliver puts it, ” What is it you plan to do with your one wild and precious life?” In other words, the container is not an end in itself, but exists for the sake of your deeper and fullest life, which you largely do not know about yourself! Far too many people just keep doing repair work on the container itself and never “throw their nets deep” (John 21:6) to bring in the huge catch that awaits them. What a gift we all have. Let’s celebrate the gift that was given to us, continue to turn inward in daily contemplative meditation or centering prayer and be love and joy. So thank you Mr. Cather and my parents for the means and opportunity to play. Thank you varsity pitching coach, I can not remember your name for at least getting me on the team. (As you may have guessed I didn’t make varsity) Thank you Coach Ickes. Thank you Tom Linnert, my sophomore pitching coach for spending time with me and showing love in your coaching and more importantly helping me on my spiritual path. Thank you to all my mentors and teachers. Thank you to my most recent spiritual teacher, Fr. Richard Rohr. And thank you Steve Sax, Vin Scully, Tommy Lasorda and all the Dodgers, present and past! Go Blue! 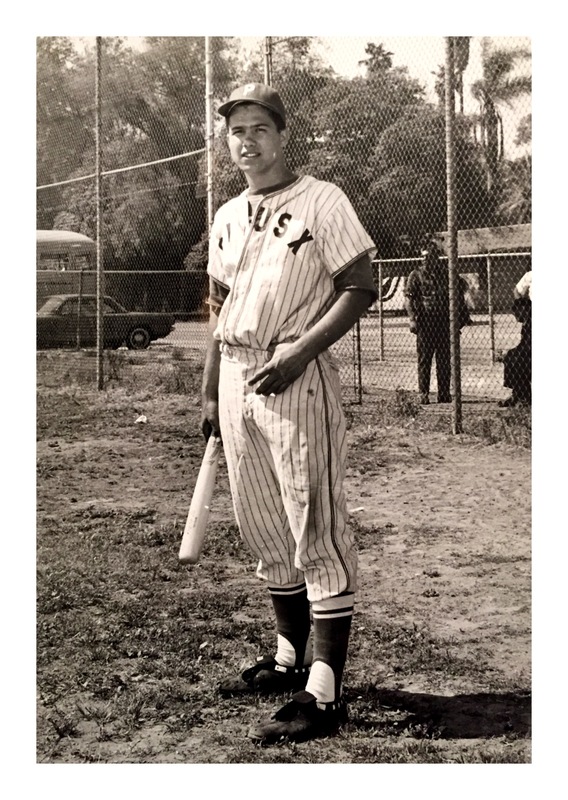 Below is my father at Pius X High School in Downey, CA. A 4 year varsity letterman, played for the Detroit Tigers farm system, turned down a scholarship to play for USC in favor of a 4 year full scholarship to the then top engineering school in the country in Michigan. Love you Pops! If I could have just one wish today it would be for all my patients, family, friends & fellow citizens of this world to read Janice Stanger, PhD’s wonderful book the Perfect Formula Diet. Health and healing at its foundation is at all of our fingertips with this simple nutrition approach. And that is all. That is all you need. As the Beatles sang to the mountain tops, ‘All you need is Love!” For nutrition, all you need is Plants! And believe me she will back it all up in the book with nutrition science fundamentals. You will learn so much about the myths in nutrition that have been perpetuated by the animal and dairy industries. You will feel a sense of liberation intellectually and then physically, & emotionally as your body heals. So beautiful, so simple, so loving & pure. And as earth day approaches, know that as you eat to heal your body you will also be eating to best heal the planet as animal agriculture is the single greatest cause of environmental destruction. 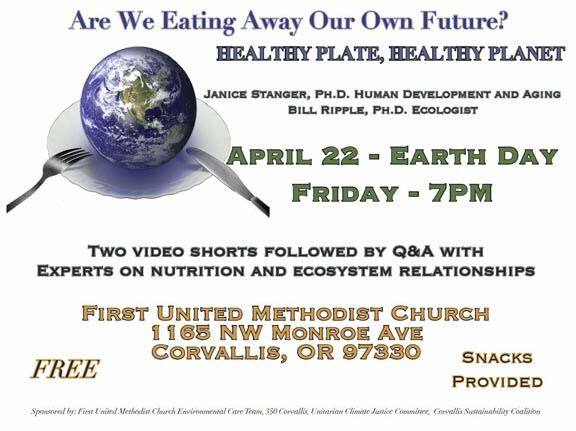 If you are local in Oregon, please come on Earth Day, April 22nd to Corvallis (details below) to see Janice and William Ripple, PhD speak on these 2 topics. I will be there and hope to see many of my patients, friends, resident physicians & colleagues there too! We welcome Dr. Janice Stanger, who holds a PhD in Human Development and Aging and is author of The Perfect Formula Diet. And William J. Ripple, PhD, who is a Distinguished Professor of Ecology at Oregon State University in the Department of Forest Ecosystems and Society. He is a widely published researcher and a prominent figure in the field of ecology. Lets remember that you have about 70,000 miles of blood vessels running through your body. AT Still, MD, DO the founder of my osteopathic profession stated that the rule of the artery is supreme and he was dead right. He also drove his students to always find and fix the cause. Our leading cause of death is due to atherosclerosis/heart disease. Without blood flow tissues degrade and die. Do you know that in adulthood we lose 0.5 % of blood flow to the brain per year and by age 65 on average we have lost 20% total flow to the brain. Less blood flow, more cell death, increase risk for dementia. The leading cause of chronic low back pain and degenerative disk disease is lack of blood flow (ischemia) due to atherosclerosis. The research shows that saturated fat, oils, sugar, salt, white flour and dairy products create endothelial (the innermost single cell lining of your arteries) inflammation and destruction. We should eat a diet that minimizes all of these if we want to reverse any accrued damage and given that most of us grew up on a standard american diet we all have have plenty of work to do. Endothelial damage has been documented in infancy so it is never too soon to be talking about it and preventing it. Unfortunately ‘healthier’ diets like the paleo diet or the Mediterranean diet have yet to demonstrate atherosclerosis reversal. So the gold standard is the no oil, no sugar, no animal or dairy, minimal or no salt whole food plant based diet. This is the diet that I follow very happily. I look forward to my meals and I love what I eat. I also love knowing that with every meal and am reversing disease and improving blood flow. It only takes 3 weeks on this dietary plan to reset your taste buds to their natural state. Then you will find how much more you can taste the sweetness and savoriness in natural whole foods. To read more on this, Read the recently published How Not To Die by Michael Greger, MD. You can go to my website drkyle.com for more resources as well. 1. Choose plant-based foods: vegetables, beans, whole grains, and fruit. 2. Minimize refined grains, added salt, and sweeteners. 3. Include some nuts and seeds; avoid oils. 4. Avoid foods containing saturated and trans fats. 5. Have a reliable source of vitamin B12. Minimize or avoid the RED ZONES for optimal health and disease prevention and reversal. It will be a healing sanctuary for humans and animals. And of course all covered by the Oregon Health Plan as they will recognize that this is the best way of truly keeping patients & communities well. The best way to prevent and reverse disease rather than continuing to create permanent patients that require a lifetime of expensive pharmaceutical drugs and surgical interventions. The best way to treat cause rather than merely inefficiently and dangerously* just keep plugging up the leaks by treating symptoms with drugs. 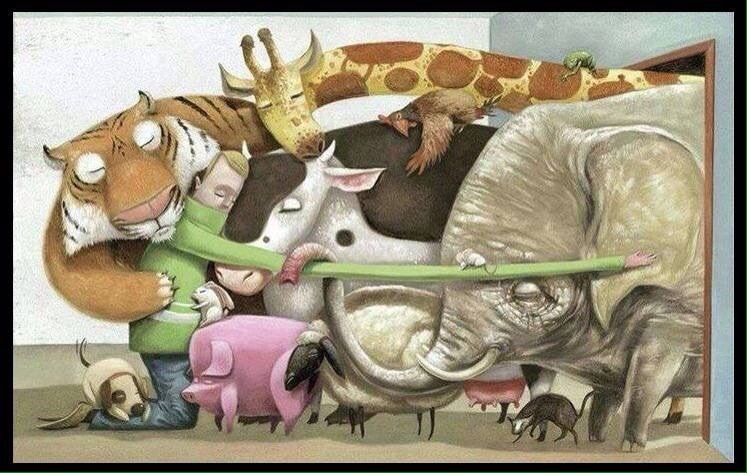 All humans and animals deserve to be happy and free. Eating animals is unnecessary for health for most humans and currently is the main cause of disease in the US. It is also environmentally unsustainable and so I am sorry to say we must live and teach the vegan way, non-judgmentally but without apology. It is the only answer for individual, global and planetary health. We can not continue to define individual health in a bubble as being isolate and separate from the community and the planet. All of our choices effect our communities the animals and our shared environment. Avoid all dairy products and animal flesh. Lets work to end unnecessary suffering of humans and all earthlings. May we create communities that enable a way of living that does not require working for corporations that continue to engage in violent, unethical and environmentally unsustainable practices. May we create sustainable, gift economy communities that prioritize health, family, mental and emotional health over ego, 3rd party corporate financial gains. Where all people have access to our best medicine, plants. Choose politicians that are driven to help the people and planet over corporate & special interests. Invest in companies that are non-violent to animals, humans and the planet. Separation is an illusion. We are all connected whether we like it or not. Persistent thoughts of isolation feed dis-ease. We need to learn to ground ourselves and connect again to prevent disease. We can do this through prayer, meditation, exercise and whole food plant-based nutrition. Nutrition should be as non-violent as possible and in balance with our natural environment. The Standard American Diet (SAD) is violent; towards our own health, towards the planet and of course towards animals. It is nutrient poor, calorie rich and feeds disease. It prevents reconnection to our true selves, to each other and the earth. Animal agriculture more than anything is destroying the natural world. Take a huge step in the right direction and remove animal flesh and milk from your diet. We are no longer in balance with our ecosystem and the days of the hunter-gather justification need to pass if we are to have any chance to get back into balance with ourselves, our community and our home, planet earth. The earth can simply not handle over 7 billion omnivores. Ask any scientist who understands ecology. And think about what statement is made by choosing animal flesh simply for taste and habit while every day more of the lungs of our planet are destroyed to raise livestock, our rivers polluted with run off from CAFOs, our oceans over fished to death, sentient, loving beings separated from their mothers, and slaughtered in infancy for taste, convenience and habit. We should ask ourselves if we are truly OK living in a way where we have others do our dirty work and slaughter animals for our taste and habit. There is nothing more personal than a person’s freedom of choice. No one wants to be told who to believe in or worship, who to love or not to love. And yes I know, no one wants to hear yet another vegan telling them what they are eating is wrong. Just another judgmental, righteous vegan, right? This not judgement, we are neighbors sharing this space and we want to end needless suffering. I am sorry but we just need to accept the facts and wake up or we will destroy this planet. We have already lost so much, 1000s of species are extinct because of our collective behavior. It is predicted that by 2040 there will no edible fish left in the sea. We share this planet and we are all connected. Some of us can not help but feel the pain of others who suffer. Children in the world starving only due to the greed of another or more vile, a corporation. Most our grain feeds cattle, where it could feed so many humans that are starving. Making the choice to stop eating animals is freedom, it brings hope, trust me. And as a physician, who has a bit of knowledge about health, please know that avoiding animals, eating whole foods and exercising can decrease your risk of all chronic diseases including our biggest killers 1) Heart disease 2) Cancer 3) Iatrogenic (medically caused) by 80%. We know that a whole food, low fat, oil free diet reverses heart disease. I am sure every one of us as been affected in some way by heart disease and cancer which have been called the animal’s revenge. You can see it as such metaphysically or purely based on an ecological system attempting to return to balance. If we all thrived on high animal protein and saturated fat certainly our population numbers would be even higher than they are now. And no, it is not just about living longer (but vegans do) but more importantly it is about truly living and feeling good while we live. Having the vitality to enjoy life in all of our years. To laugh, travel and serve others. In modern times we are living longer due to advances in hygiene, medical care and medications which keep us afloat yet cause a multitude of side effects (see 3rd most common cause of death above), but we need to find a way to live here in a sustainable way that begets a higher quality of life. Shifting to a plant-based diet is essential to this effort. Use food as your best medicine so we an avoid treating prolonged imbalances that eventually create disease with mere medications. We always want to treat the cause. Always ask your doctor what is the cause of the problem and how can I FIX it not just manage it with a medication. Are you eating mostly whole plant-based foods? Are you moving your body on a regular basis? Are you breathing deeply? Some can not exercise but we can all breathe so when in doubt, start with the breath. Are you managing your stress in a way that helps you heal rather than hurting you? Are you sleeping soundly, amply and feeling rested? Are you connected? Spiritually, with another, with the earth and our animal friends? Eat plants, not animals. Eat whole foods. Minimize processed foods (which include oils). Avoid genetically modified foods. Know where your food comes from. Get to know your farmers, buy local and grow your own if you can. If you take any medications, let your doctor know if you plan on making big changes as adjustments may need to be made (decreasing or stopping, depending on how strict you are with the change) especially if you have high blood pressure or diabetes. For some, it starts with small steps, one more veggie meal at a time. For others, a radical shift works and is critical. Let me know if you have any questions.